En aften i historiens tegn med Marthe Cohn. Hør hendes utrolige historie om tro, mod og spionage. Marthe Cohn var en 20-årig fransk jødisk kvinde da nazisterne invaderede Frankrig i 1940. Hun sluttede sig til den franske modstandsbevægelse og blev rekrutteret til at være spion. Hun indfiltrerede nazisterne, idet hun lod som om hun var en tysk nazi sygeplejerske, og indsamlede værdifuld information for de allierede. Som 80-årig fik Cohn Frankrigs højeste militære udmærkelse: Médaille Militaire. Marthe Cohn was born in Metz, France in 1920. She was a devoutly religious Jewish woman living just across the German border in France, when Hitler rose to power. As the Nazi occupation escalated, Marthe’s sister was sent to Auschwitz while her family fled to the South of France. Marthe chose to fight back, and joined the intelligence service of the First French Army. Utilizing her perfect German accent and Aryan appearance, Marthe posed as a German nurse desperately trying to obtain word of a fictional fiance. She traveled the countryside and approached troops sympathetic to her “plight,” thereby obtaining critical information for the Allied commanders. When, at age 80, Cohn was awarded France’s highest military honor, the Medaille Militaire, not even her children knew to what extent this modest woman faced death daily to defeat the Nazi Empire. At its heart, this remarkable story is the tale of an ordinary human being who, under extraordinary circumstances, became the hero her country needed her to be. In 2002 Marthe penned her memoir, “Behind Enemy Lines: The True Story of a French Jewish Spy in Nazi Germany.” She lives together with her husband in Palos Verdes, CA and travels internationally, sharing her remarkable story. 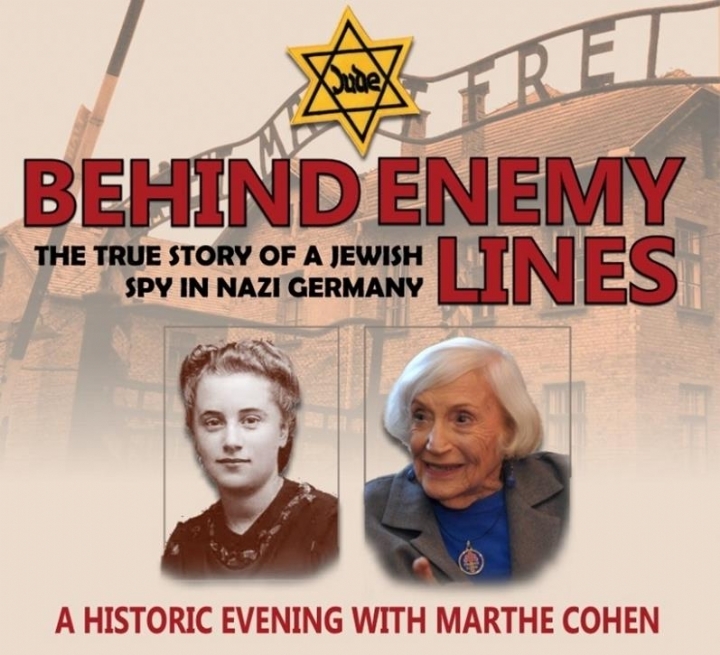 This is an exciting opportunity in our lifetime to meet a heroine the likes of Marthe Cohn, –and hear this remarkable woman tell her incredible story of courage, faith & espionage. Studiegrupper og forelæsninger, ugentlige og igangværende kurser.